The 2013 L.L.Bean Bootmobile Outdoor Discovery Tour is coming to Chicago next weekend with a return visit by the “Bootmobile” to Navy Pier. The tour is part of a summer-long effort by L.L.Bean to inspire families to spend more time outdoors and provide an opportunity to try a new outdoor activity. The 2013 L.L.Bean Bootmobile Outdoor Discovery Tour comes to Chicago this summer with a return visit by the “Bootmobile” to Navy Pier. 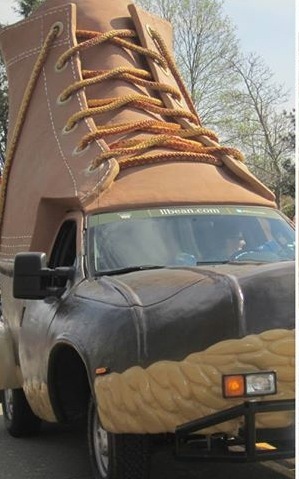 The Bootmobile is a larger-than-life sized vehicle in the form of the famous Bean Boot, on tour as part of a summer-long effort by L.L.Bean to inspire families to spend more time outdoors and provide an opportunity to try a new outdoor activity. Learn More About Local Outdoor Resources – L.L.Bean will offer outdoor activity books for kids and provide information about local outdoor resources and activities in the Chicago area. Local residents are invited to share their outdoor tips and suggestions by posting to Facebook, Twitter, Pinterest and Instagram using #OutdoorDiscovery. Win Great Gear – L.L.Bean will offer giveaways (while supplies last) and a chance to win a hiking, camping or beach gear prize package. Find Out How to Discover Outdoor Resources on Your Own – L.L.Bean’s ParkFinder tool and app, powered by Oh, Ranger! allows you to search thousands of national, state and local parks and public lands for outdoor activities including biking, birding, climbing, hiking, fishing, picnicking and much more. A survey conducted by L.L.Bean and the National Park Foundation found that 60% of parents say, their children spend less than an hour a day outdoors. The goal of the Outdoor Discovery Tour is to encourage young people to enjoy the lifelong benefits of a healthy, active lifestyle. For more information about the 2013 L.L.Bean Bootmobile Outdoor Discovery Tour, visit www.llbean.com. You can also follow the Bootmobile on Twitter: @Bootmobile.